"An old-time combination from scratch mixture." Place mustard seeds, allspice berries, whole coriander seeds, and red pepper flakes into a small glass jar with a tight-fitting lid. Shake to combine. Add ground ginger to seeds and shake again. Sprinkle crumbled bay leaves over spice mixture and place cinnamon stick halves into the jar. Seal and shake to combine. Mixture can be stored in the tightly sealed jar for up to 1 month without loss of flavor. See how easy it is to make vanilla extract from scratch. You can substitute caraway seeds for coriander seeds if desired. Drop a whole clove of garlic into each jar of cucumbers as the final spice element to this blend. The fresher your spices the more pungent your pickling blend will be. Spices that have been ground into a fine powder have more surface area and should be used carefully or they will overpower the mix. Your finished mix will store in an airtight container out of direct sunlight or heat levels above room temperature for about a month before the individual flavor characteristics of the spices begin to disappear. Try using this pickling spice along with a brine for overnight quick pickling of tough meats. The next morning rinse and pat dry the meat before slow roasting in a water bath at low heat for several hours. This basic recipe is easy to double or triple for larger projects; just be sure to keep the proportions intact. The fresher your spices the more pungent your pickling blend will be. Spices that have been ground into a fine powder have more surface area and should be used carefully or they will overpower the mix. Your finished mix will store in an airtight container out of direct sunlight or heat levels above room temperature for about a month before the individual flavor characteristics of the spices begin to disappear. 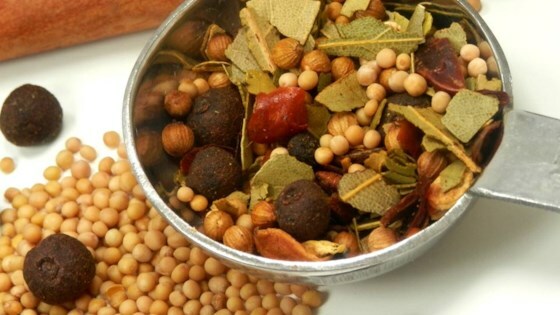 Try using this pickling spice along with a brine for overnight quick pickling of tough meats. The next morning, rinse and pat dry the meat before slow-roasting in a water bath at low heat for several hours. Not bad, but the cinnamon was overpowering. Will try again, with significantly less cinnamon. Had an abundance of cucumbers in the garden and decided to make some pickles. I didn't have any pickling spice made up and this recipe was just the ticket!! Thanks for posting. Great recipe! I used this "Homemade Pickling Spice" recipe for making pickled eggs (Allrecipes, Popa's Pickled Eggs, bd.weld). They taste excellent! Thank you Mooseinthekitchen for sharing your recipe. Wonderful! This is a recipe I will use again and again! Thanks for posting it. Really wonderful and absolutely no changes.